Preheat the oven to 450°F. Place the 4 peppers in a baking tray and bake for 15-20 minutes. Remove any excess skin from the top of the pepper. Softly cut open the top of each pepper and remove the seeds. Stuff each pepper with mashed potatoes. Sprinkle cheese on top of each pepper and return them to the oven to 5-8 minutes or until the cheese has melted. Add a little more cheese, the bacon and onion on top. Serve hot. For a vegetarian dish, you can omit the bacon and add more cheese. Celebrate St. Patrick's Day with poblano peppers! 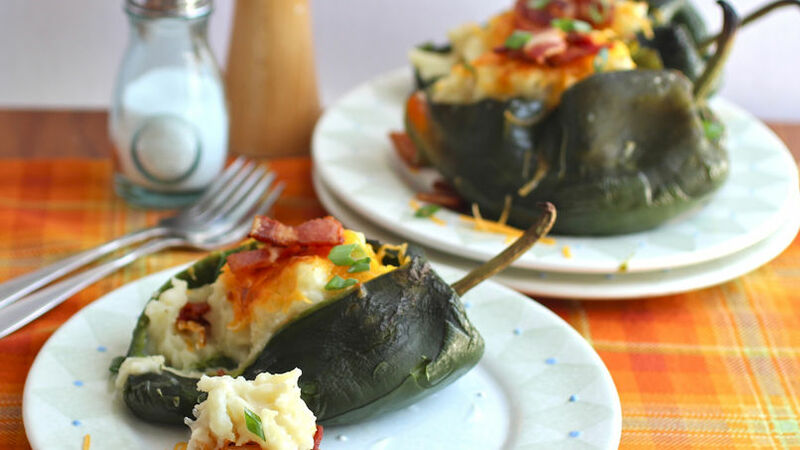 These peppers are a little spicy and are filled with creamy mashed potatoes, cheese, bacon and green onion. The combination of flavors and textures is absolutely delicious. If you're looking for a St. Patrick's Day dinner idea, I know you'll love this recipe!